Click here to view my full, up-to-date list of all Hindi movies currently available on Netflix. This is probably my favorite sports movie ever. 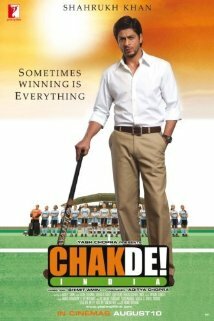 Shahrukh Khan plays the coach of the talented but underestimated Indian national women’s field hockey team. It’s a great film for families, and especially for girls. Its pro-diversity message also makes it one of the most patriotic Bollywood films out there. Three cricket-loving young men find their hopes for the future dashed by an earthquake and a wave of political and religious violence. 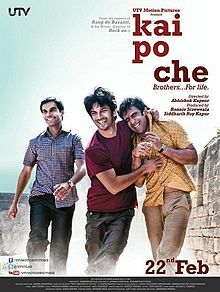 Kai Po Che is worth watching for performances by some of Bollywood’s hottest young stars. 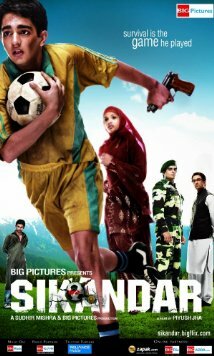 Like Kai Po Che!, Sikandar is another film in which violence intrudes upon the life of a young athlete, this time a soccer player. A coach turns a bunch of wrestlers into cricket players. Three single friends go on one last road trip, challenging themselves with extreme sports like sky diving along the way. A fun movie with a super cast. 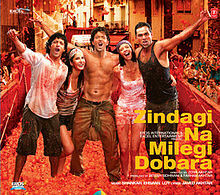 My favorite part of ZNMD is the song “Señorita,” sung by the movie’s stars: Hrithik Roshan, Farhan Akhtar, and Abhay Deol. 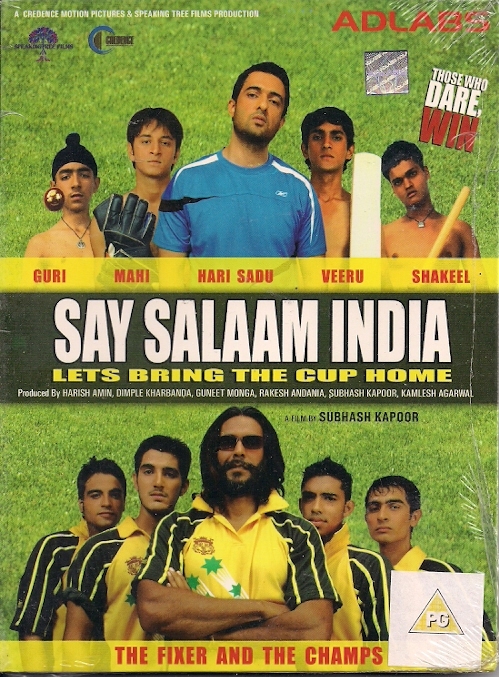 This entry was posted in Streaming Video and tagged Bollywood, Bollywood Movies on Netflix, Chak De India, Desi Movies on Netflix, Hindi, Hindi Movies on Netflix, Indian, Indian Movies on Netflix, Kai Po Che, Movie, Netflix, Say Salaam India, Sikandar, Sports, Streaming Video, Zindagi Na Milegi Dobara on March 27, 2015 by Kathy. Kai Po Che! is now available on Netflix streaming. With the recent addition of ABCD to the catalog, two of my three favorite Bollywood films of 2013 are currently available on the service. If they add Matru Ki Bijlee Ka Mandola, I’ll be all set. This entry was posted in Streaming Video and tagged 2013, ABCD, Bollywood, Hindi, Indian, Kai Po Che, Movie, Netflix, Streaming on May 14, 2013 by Kathy. Pickings remain slim in Chicago area theaters. Only one new Hindi movie opens locally on March 22, 2013, and it’s not the one I wanted. Instead of the creepy-looking Bipasha Basu/Nawazuddin Siddiqui horror flick Aatma, we get Rangrezz, producer Vashu Bhagnani’s latest attempt to turn his son, Jackky, into a Bollywood star, against the wishes of audiences everywhere. Rangrezz opens on Friday at the Big Cinemas Golf Glen 5 in Niles. It has a listed runtime of 2 hrs. 20 min. The Golf Glen 5 is the only theater in the Chicago area carrying any Indian movies this weekend, including the Hindi films The Attacks of 26/11 and Kai Po Che! (which has earned $1,080,384 from four weeks in U.S. theaters), as well as Paradesi (Tamil) and Romans (Malayalam). Just four weeks after its theatrical release, The Attacks of 26/11 joins the catalog of films of available on Eros Now on Friday. Like 3G, it’s considered a premium title that’s free to subscribers or available for a 48-hour rental for $1.99. This entry was posted in Weekly Theater Updates and tagged 2013, Aatma, Big Cinemas Golf Glen 5, Bollywood, Chicago, Earnings, Eros Now, Friday, Hindi, Indian, Jackky Bhagnani, Kai Po Che, Malayalam, March 22, Movie, Niles, Paradesi, Rangrezz, Romans, Runtime, Tamil, The Attacks of 26/11, Trailer, Vashu Bhagnani on March 21, 2013 by Kathy. Update: The new release 3G is currently available on Eros Now not only to subscribers but on a 48-hour rental basis for $1.99. However, due to rights restrictions, the film isn’t available online in India, Pakistan, Burma, Fiji, UAE, Mauritius, Kenya, or South Africa. Uh-oh. This is the second weekend in a row with no new Hindi movies opening in Chicago area theaters. The absence of Jolly LLB isn’t a surprise, but I expected Y-Films’ Mere Dad Ki Maruti to release here. I’m still hopeful that we’ll get the Bipasha Basu horror flick Aatma next week, but there’s a chance Chicago area Bollywood fans will have to go without until Himmatwala debuts on March 29. The good news is that Eros Now subscribers can watch 3G on the streaming service starting this Friday, March 15, the same day that it opens in India. That bad news for Neil Nitin Mukesh fans is that the failure of 3G to get a large roll out on the heels of a very small U.S. release of David last month seems to definitively rule him out as a bankable international leading man. I expect we won’t see much of him in The States in the future outside of roles in ensemble pictures like 7 Khoon Maaf. In the meantime, Kai Po Che! — which has earned $1,013,738 from three weeks in U.S. theaters — carries over for a fourth week at the Big Cinemas Golf Glen 5 in Niles, AMC South Barrington 30 in South Barrington, and Regal Cantera Stadium 17 in Warrenville. The Golf Glen 5 is also holding over The Attacks of 26/11 for a third week, as well as Back Bench Student (Telugu), Paradesi (Tamil), and Romans (Malayalam). This entry was posted in Weekly Theater Updates and tagged 2013, 3G, AMC South Barrington 30, Back Bench Student, Big Cinemas Golf Glen 5, Bollywood, Chicago, Earnings, Eros Now, Friday, Hindi, Indian, Jolly LLB, Kai Po Che, Malayalam, March 15, Mere Dad Ki Maruti, Movie, Neil Nitin Mukesh, Niles, Paradesi, Regal Cantera Stadium 17, Romans, South Barrington, Tamil, Telugu, The Attacks of 26/11, Warrenville on March 14, 2013 by Kathy. For the first time in months, there are no new Hindi movies opening in Chicago area theaters this weekend. The sequel Saheb, Biwi aur Gangster Returns didn’t make the cut locally, which isn’t a surprise given that the original Saheb, Biwi aur Gangster earned a pathetic $13,634 in the two weeks it spent in U.S. theaters in 2011. As of Friday, March 8, 2013, Kai Po Che! remains the most widely available Hindi movie showing in Chicagoland. After earning $876,568 from its first two weeks in the U.S., it carries over at the AMC River East 21 in Chicago, Big Cinemas Golf Glen 5 in Niles, AMC South Barrington 30 in South Barrington, and Regal Cantera Stadium 17 in Warrenville. Many theaters have cut back on the number of showings per day of Kai Po Che! and other niche films to free up screenspace for Oz The Great and Powerful, so make sure to check the schedule before heading to the theater. With first weekend U.S. earnings of $159,619, The Attacks of 26/11 gets a second weekend at the Golf Glen 5, South Barrington 30, and Cantera 17. The Golf Glen 5 is the only area theater holding over last week’s other new release, I, Me aur Main, which presumably fared even worse at the box office. Other Indian movies showing at the Golf Glen 5 this weekend include the Telugu film Gundello Godari and the Malayalam film Manjadikuru (“Lucky Red Seeds“). This entry was posted in Weekly Theater Updates and tagged 2013, AMC River East 21, AMC South Barrington 30, Big Cinemas Golf Glen 5, Bollywood, Chicago, Earnings, Friday, Gundello Godari, Hindi, I Me Aur Main, Indian, Kai Po Che, Lucky Red Seeds, Malayalam, Manjadikuru, March 8, Movie, Oz The Great and Powerful, Regal Cantera Stadium 17, Saheb Biwi aur Gangster Returns, South Barrington, Telugu, The Attacks of 26/11, Warrenville on March 7, 2013 by Kathy. Two more new Hindi movies are set to open in the Chicago area on March 1, 2013. The romantic drama I, Me Aur Main stars John Abraham as a pampered man-child opposite Chitrangada Singh and Prachi Desai. I, Me Aur Main opens on Friday at the Big Cinemas Golf Glen 5 in Niles, AMC South Barrington 30 in South Barrington, and Regal Cantera Stadium 17 in Warrenville. It has a listed runtime of 1 hr. 46 min. Director Ram Gopal Varma’s thriller The Attacks of 26/11 also opens in area theaters on Friday. Given the relative freshness of the wounds inflicted by the 2008 Mumbai terror attacks, I’m curious to see if RGV will rein in some of his more eccentric directorial quirks and tell a more somber, straightforward story. The Attacks of 26/11 opens on Friday at all of the above theaters and has a listed runtime of 1 hr. 59 min. Kai Po Che! posted strong first-weekend U.S. earnings of $522,765, meriting a second week in all of the above theaters plus the AMC River East 21 in Chicago. The disappointing gangster drama Zila Ghaziabad, predictably, does not get a second week. On Friday, Special 26 begins its fourth week at the South Barrington 30, while ABCD departs local theaters with total U.S. earnings of $218,257. Other Indian movies showing at the Golf Glen 5 on Friday include Kammath & Kammath (Malayalam) and Mr. Pellikoduku (Telugu). This entry was posted in Weekly Theater Updates and tagged 2013, ABCD, AMC River East 21, AMC South Barrington 30, Big Cinemas Golf Glen 5, Bollywood, Chicago, Chitrangada Singh, Earnings, Friday, Hindi, I Me Aur Main, Indian, John Abraham, Kai Po Che, Kammath & Kammath, Malayalam, March 1, Movie, Mr. Pellikoduku, Niles, Prachi Desai, Ram Gopal Varma, Regal Cantera Stadium 17, Runtime, South Barrington, Special 26, Telugu, The Attacks of 26/11, Trailer, Warrenville, Zila Ghaziabad on February 28, 2013 by Kathy.